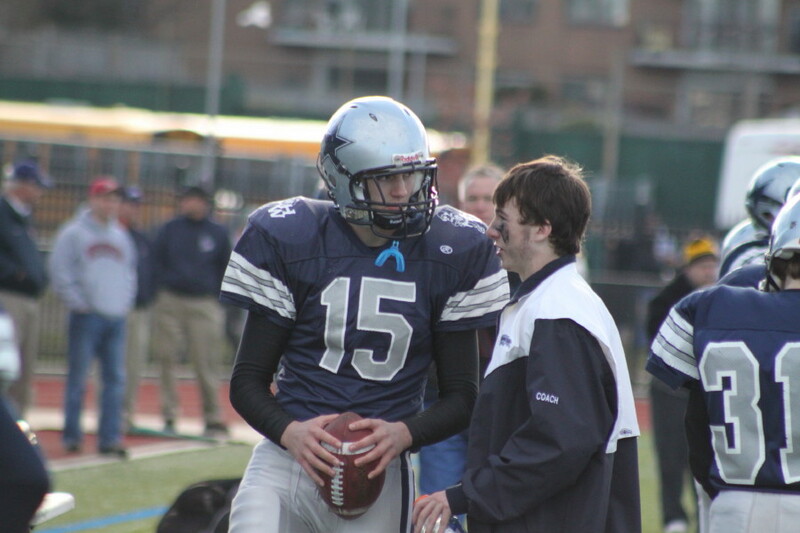 Backup QB Steve Brao gets pointers from injured Trevor Lyons prior to the start of the second half. Joe Epps (48) escapes Elliott Burr for five-yard score in first quarter. 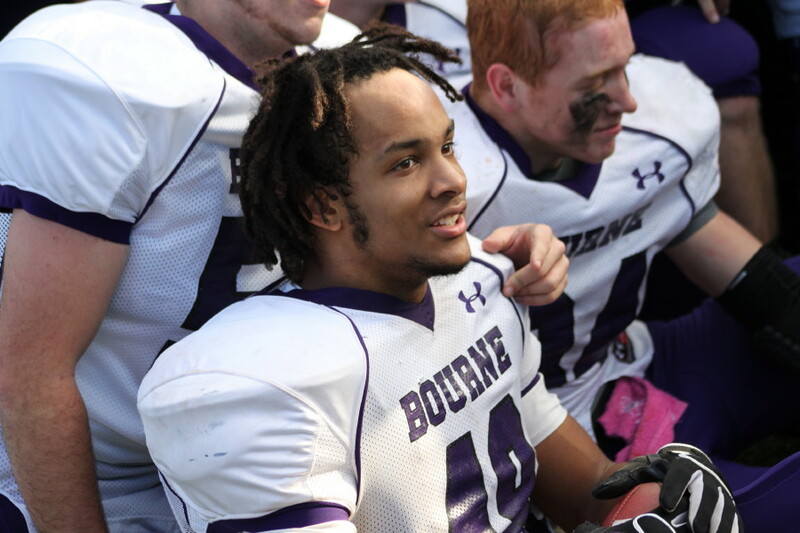 (Lynn) Argue the point if you will, but the two best players on the field at the start of the Division 3A Super Bowl game between Bourne and Hamilton-Wenham were Bourne’s running back Joe Epps and HW’s quarterback Trevor Lyons. Both players score points and chew up yards, and most important, both players make life easier for their teammates. Defenses concentrating on either Joe or Trevor get burned by each one’s ball-carrying, or in the case of Joe, ball-throwing teammates. That’s what made this matchup so intriguing…..the multi-faceted offenses. That all went down the drain in the second quarter when a shoulder injury forced Trevor to leave the game for good just after he had thrown a go-ahead, 44-yard touchdown pass to Matt Putur with 2:32 left until halftime. Up for the moment, 14-8, the troubles for the Generals began immediately….like on the next play, the 2-point conversion attempt. I saw #15 (Steve Brao) in at quarterback and thought HW was running some sort of Wildcat formation. The play was a disaster and the ball ended up on the ground with no points scored. How big was the play when early in the second half the Canalmen tied the score and then made their 2-point conversion to get the lead, 16-14? That lead held up the rest of the way! 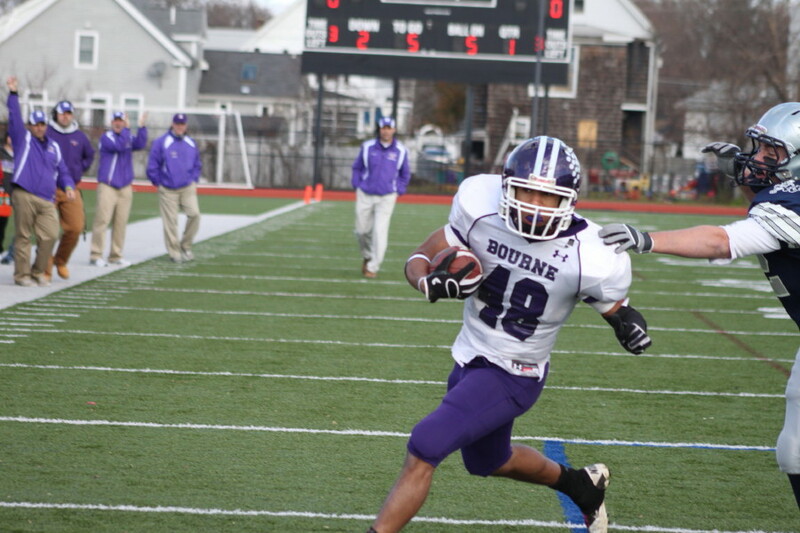 Bourne nearly had the touchdown back immediately as Joe Epps got his hands on the kickoff. 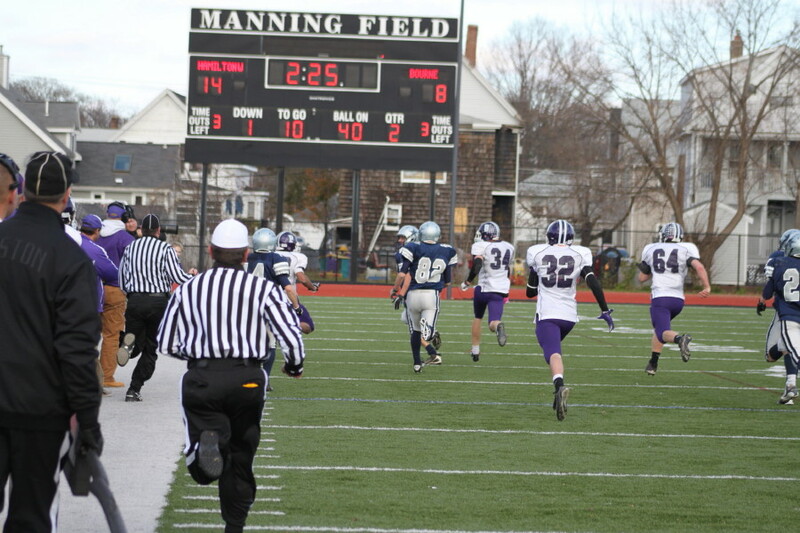 The speedster headed to his left, down the Bourne sidelines, and was on the HW 25 before he was tackled. With time running down, the Canalmen reached the ½ yard line in four plays before quarterback Jason Moriarty fumbled the snap and the ball ended up in the end zone in Kevin Anthony’s possession. The Bourne miscue enabled the Generals to get off the field with a 14-8 advantage. Jacob Achstetter (34) dives to half yard line at end of first half. You had to figure at halftime that minus Trevor the Generals weren’t destined for many (any?) points in the second half. But their defense hadn’t allowed more than two touchdowns in a game. 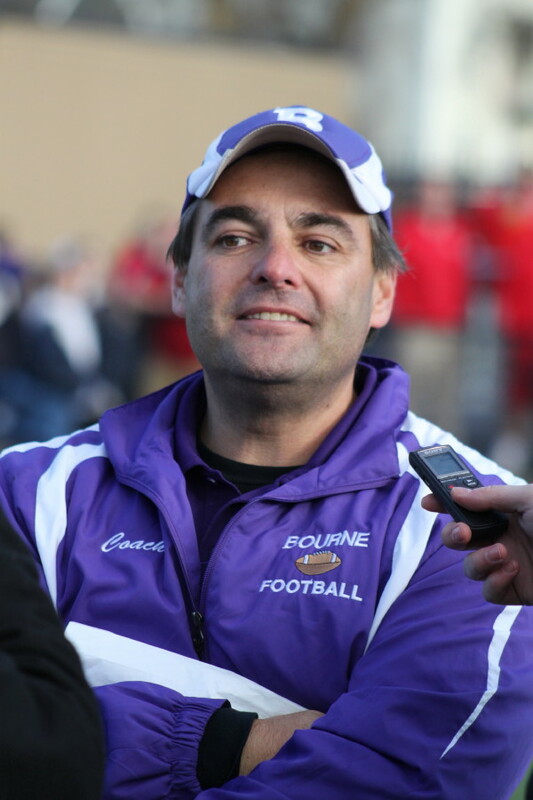 If they could keep Bourne off the board they’d win the Super Bowl. HW had good field position early in the third quarter when Jason Moriarty fumbled for the second time and Kevin Anthony had his second recovery. So HW started at the Bourne 44. That good-looking opportunity fell apart in one play as Elliott Burr was hit from behind and lost the ball to Drew Girouard. 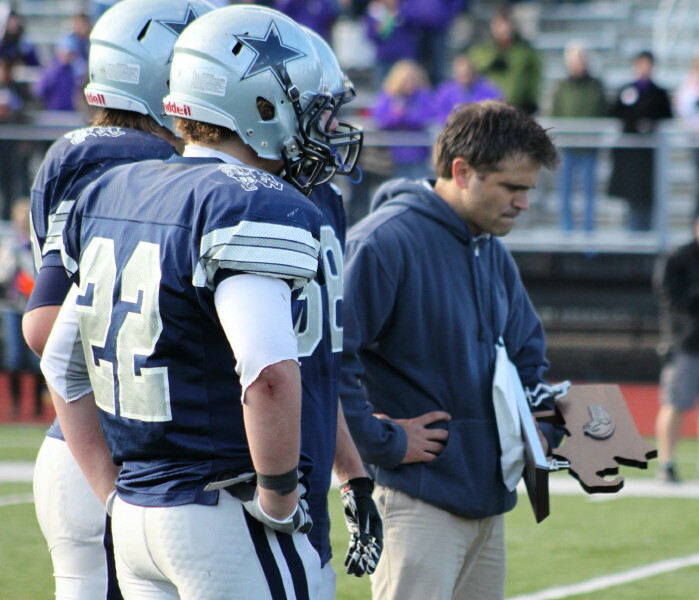 The Canalmen then went ahead and, for all intents and purposes, won the Division 3A Super Bowl by putting together ten-play scoring drive with the crucial 2-point conversion. The “Joe Epps Factor” figured in both the TD and the 2-point conversion. Joe runs primarily (only?) to his right from his wingback spot and teams that don’t set up for strong coverage on their left corner will pay. Joe had 19 Tds this season and over 1400 yards running right. He also scored a 5-yard touchdown in this game in the first quarter……….you guessed it, running right. Matt Putur (21) beats Nick Pereira (5) and Jason Moriarty (10) deep for touchdown. So when quarterback Jason Moriarty faked to Joe and followed him right, the defense committed heavily that way. 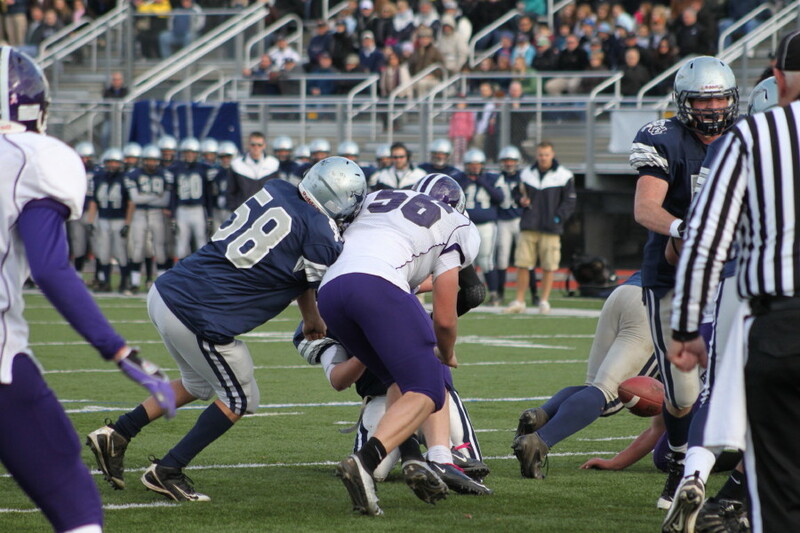 End Nick Pereira faced single coverage on the weak side defended by defensive back Steve Turpin. Jason suddenly stopped his roll right and passed back to the weak side (in the end zone) where Nick had gotten behind Steve for a nine-yard TD. The game-winning two-point conversion was a little less misdirected. QB Jason took the snap and immediately rolled to his left and plowed into the end zone rather easily. Both scores connected to the “Joe Epps Factor,” in my opinion. That’s why it was so painful to watch the HW offense function minus the “Trevor Lyons Factor,” for the last 2+ quarters. Trevor had nearly as many yards during the season as Joe and he was a threat to run around either side. Teams protecting the outside against him opened lanes for Elliott Burr to run inside. Teams protecting against either running threat were open to deep passes, including the one Trevor tossed down the middle to Matt Putur in this game for the 44-yard score in the first quarter. Minus Trevor, the Generals became easier to defend and the Canalmen had the playmakers on defense to do the job. Credit HW backup quarterback Steve Brao (sophomore) for guiding the Generals during more than half of a game he probably didn’t expect to play in at all. The weather for the noon game was terrific. Enough sun to allow us to forget that it was December 3rd. A good number of the HW faithful arrived early for some tailgating. 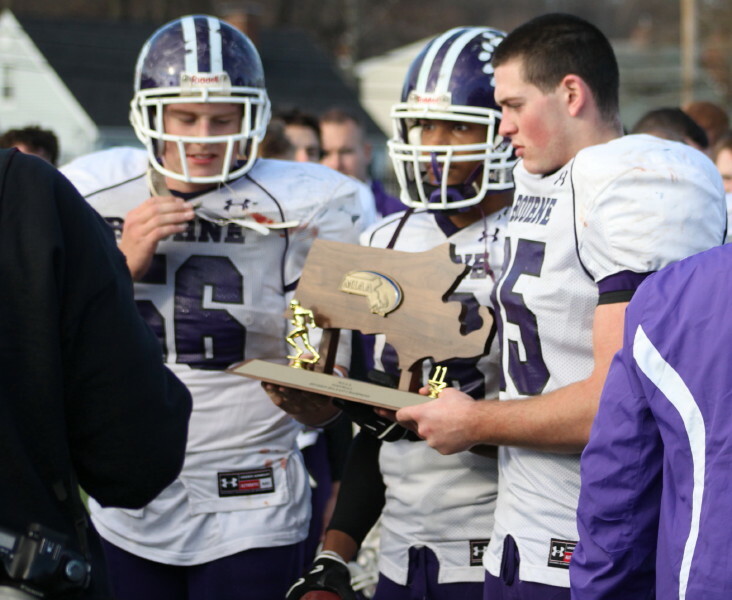 HW coach Andrew Morency with trophy. 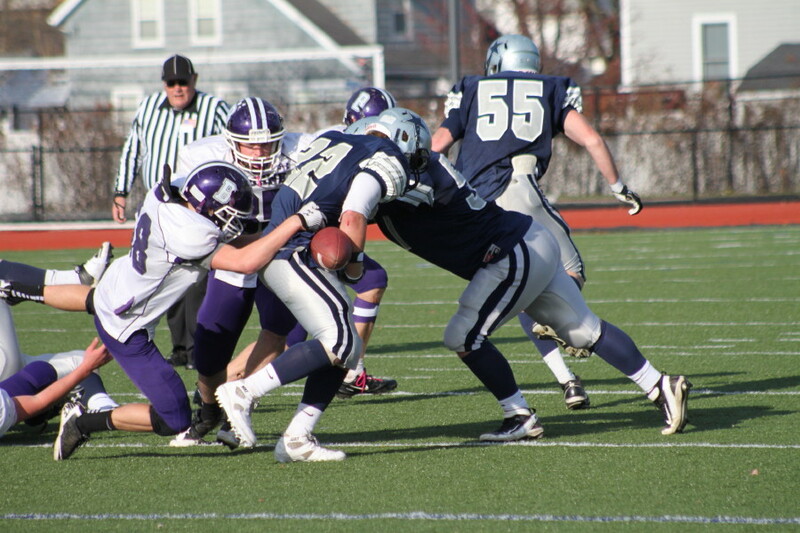 Jason Moriarty (10) defends receiver in 4th quarter. Joe Epps returns kickoff 65 yards. Jacob Achstetter (34) tackled by Luke Wendt (11).